After 12 successful years of staging the much loved ‘We Will Rock You’ Queen musical, the Dominion Theatre was tired and in need of renovation. 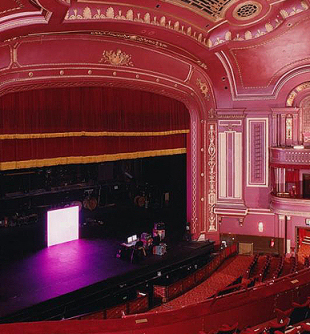 In June 2014, a 4 month renovation project got underway to restore the theatre to its former glory. Included within the project was a new Public Address & Voice Alarm system. The previous system had been working with many evolutions leaving the loudspeaker installation in varying states of completion and compliance. It is through working with many theatres over a long time that we were able to provide a detailed design and beneficial approach reusing some of the cabling from the previous incomplete installation and installing new cabling in areas where the existing installation was non-compliant. We worked through strategies to identify the special needs of highest quality delivery and economy for the appropriate areas. Like many modern venues, the theatre also hosts alternative events during non-show hours and we worked to see that they are catered for correctly. Due to the existing cable locations the central equipment was split into two locations to prevent unnecessary additional cabling. In each location an ASL Vipedia system built by BLA was installed and networked together to provide full coverage for each of the input sources. Two new firemans microphones and two new paging microphones were also installed. In the auditorium new column speakers were installed to give compliant coverage. The new loudspeakers were specially colour matched to blend in with the decorative surroundings. The show relay and stage prompt audio was previously serviced by a separate system but this has now been integrated in to the main system to give more flexibility and control for the backstage dressing rooms and other back of house areas. The biggest challenge throughout the project was the very limited time to get the system in and operating and to get cabling stealthily installed in to the listed building. The client is very pleased and congratulated our installation team on the extremely tight program in the most trying of situations. Particularly how we were able to work around the other trades, often steering around problems that we know always occur in these complex building developments.